I am so excited to share this little bit of my life today! The item you see below is a chest of drawers that my grandmother recently gave me. 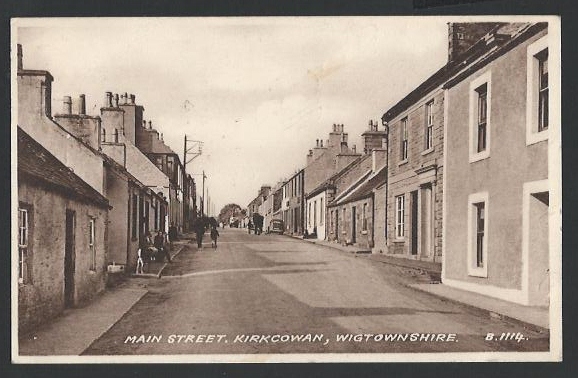 Here’s a glimpse of Kirkcowan in the 1950s. I would guess that it has gone pretty much unchanged from when my ancestors lived there. While we are still trying to determine exactly when the dresser was built, and who the original owner was, we do know for sure that it belonged to James’s son, John B. Davidson, and John’s wife, Ida Belle (Wilson) Davdison, pictured below. My grandmother remembers them having it (they were here grandparents). Ida’s father was also from Scotland. Thankfully, we have some lovely photos of John and Ida. Whether or not we ever figure out the exact story of the chest of drawers, we will have it to enjoy in our home, and hopefully future Davidson descendants will enjoy it, as well. I absolutely LOVE the history! And the dresser is beautiful. Thanks, Karen! It’s an honor to be the next caretaker of this piece of our family history. Great history, Kelli, what a beautiful chest of drawers! Thank you, Tom. I’m hoping to clean it up (gently) and fix a few bits that have broken over the years. I want it to last for future generations to enjoy.